Jaguar will showcase a new look for XK in celebration of 60 years of the iconic nameplate. The new XK60 will take pride of place alongside a display from the full Jaguar model range, in England next week. 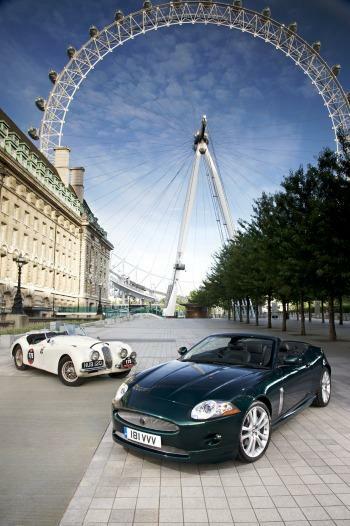 The Jaguar XK60 will be released in the UK at that time. In 1948, Jaguar developed what would become one of the most famous automotive names in the world, as the all-new and highly advanced XK engine made its debut in the revered XK120 sports car. Now, to celebrate the 60th anniversary of that iconic car, Jaguar is launching a very special series of the current XK for the UK market – the uniquely equipped and aptly named XK60, a car that pays homage to the legendary performance of its predecessors. Complementing the XK60 will be the recently introduced XKR-S, a limited edition sports coupe in Ultimate Black designed to give an even more focussed, high speed performance driving experience. Capable of 0-60 mph in 4.9 seconds and with a maximum speed extended to a limited 174 mph (280 km/h), this is the fastest Jaguar since the XJ220 super car. With just 50 available in the UK, every XKR-S is already spoken for. Sitting alongside the two XK models will be Jaguar's acclaimed XJ 2.7-litre diesel, which was recently named 'Britain's Greenest Luxury Car' for the second year running - voted for by the Environmental Transport Association. The award was given in recognition of Jaguar's commitment to delivering CO2 and fuel consumption advantages to XJ customers, with the development of an industry-leading diesel engine and the application of an advanced lightweight aluminium body structure. With over 7,000 orders in the bank in the UK and more than 21,000 worldwide, the introduction of the multi-award winning Jaguar XF has been a success for the brand. Completing next week's Jaguar dispaly will be the new X-TYPE Estate which now offers the combination of diesel power with automatic transmission – pairing the 2.2 litre diesel with a six-speed automatic, and the one-touch control of Jaguar Sequential Shift – broadening the new model’s appeal to buyers who previously could not have this combination in an X-TYPE.